Our website has established an exciting & fun program that is open to anyone wishing to take part in. Each month starting the first day of the month and ending the last day of month. Anyone can submit fan made items for the website worth sharing. This is open to anyone interested in sharing there items and talents for everyone to enjoy. Items can be, but not limited to., written articles, reviews, artwork, built-up models/dioramas, graphic art, replica props, new websites, etc. There is no limit on what you may submit provided it is in good taste, and for the best interest for the site and our viewers. At the end of each month, all items submitted for consideration will be reviewed by our website committee, and voted on by our current Yahoo members. Yahoo members will have 1 week to review items, and cast their vote for the best item of the month. Item receiving the most number of casted votes will be the monthly winner. 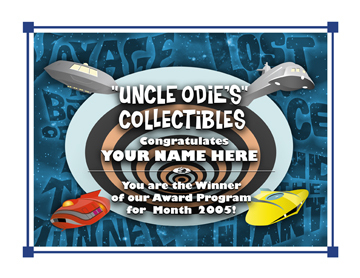 The top winner for each month, 2005 Winners, 2006 Winners, 2007 Winners and 2008 Winners, will receive a special "Uncle Odie" certificate, and item showcased on our website. Plus the monthly winner will placed in the "Uncle Odie" hall of fame. At the end of the season, the top 12 winners for each month, will again be voted on for the best item for the year. The winner will receive a very special "Uncle Odie" statue. As well as special honors being showcased on our website. (*) Note: All items be will shown on the website. Please include low resoulation images. Please include all info on items for better judging for the voters. Such as how long did it take you to make the item, materials used, and a short bio of yourself etc. Let's make this a fun and outstanding program we all will enjoy together.